Last night the power went off for 2 hours from about 1800, the whole town was at a standstill. A bar had a generator so a couple of beers was enjoyed here. As usual loud music was playing. One restaurant had candles on the tables and was serving. A great meal of pasta, cheese and other things was enjoyed. It was different. The wife of the guy that owned the internet shop frequented came and joined me with her two young children. The young boy Juan Pablo was just the best kid, 4 years and independant as can be. He and I had a bit of a friendship. He would come into the internet room and say hello to friends on skype with the headphones on. He was a great little handler of a futbol. On saying goodbye I bought the kids a couple of homemades sweets from across the road. The power came on at 2000, about the time I switched off. Rising early, the road was moving beneath the wheels before daylight. Farm workers were heading to work. Some gravel was encountered, then asphalt, this was heaven after the San Bernado track. The road was quiet winding through prime cattle country, Brahmin was the predominant breed with some fine specimens about. 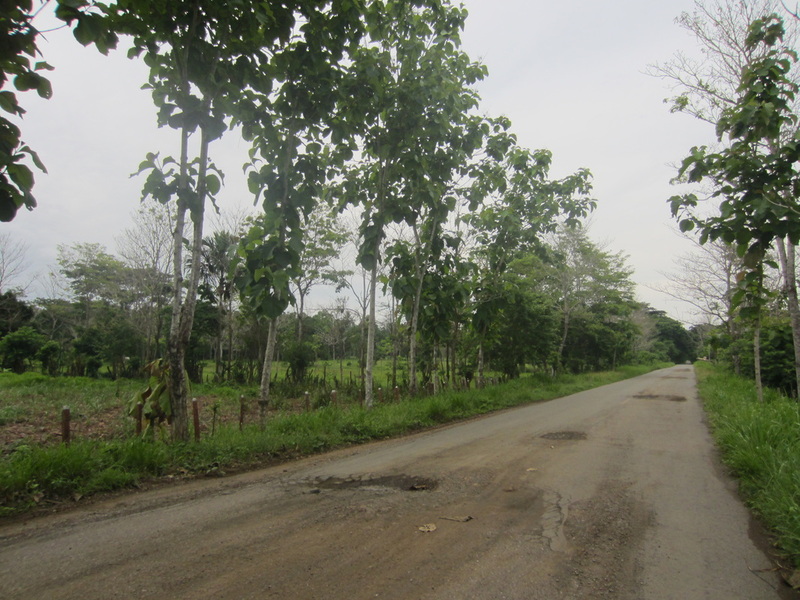 Plantations of teak trees were scattered about. They are easily identified by their huge leaves. 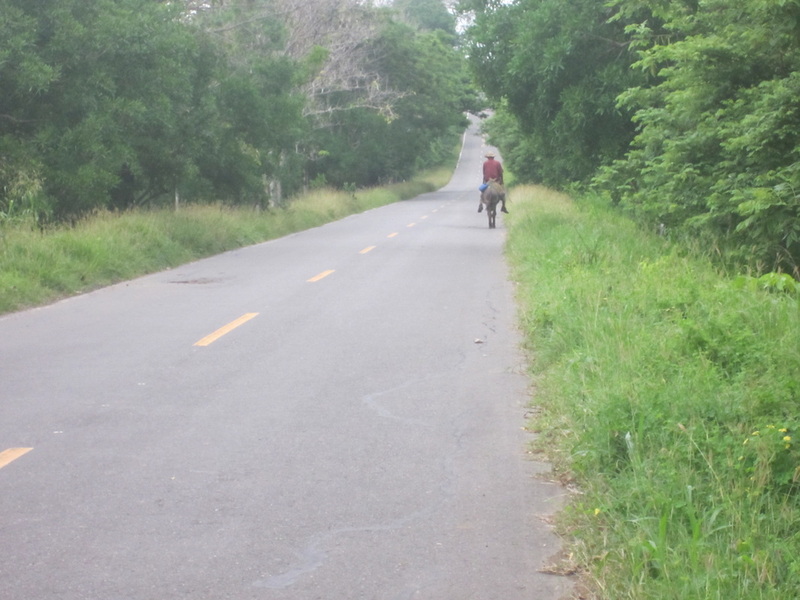 The country was best described as undulating, as was the road, except the land was everso lush. 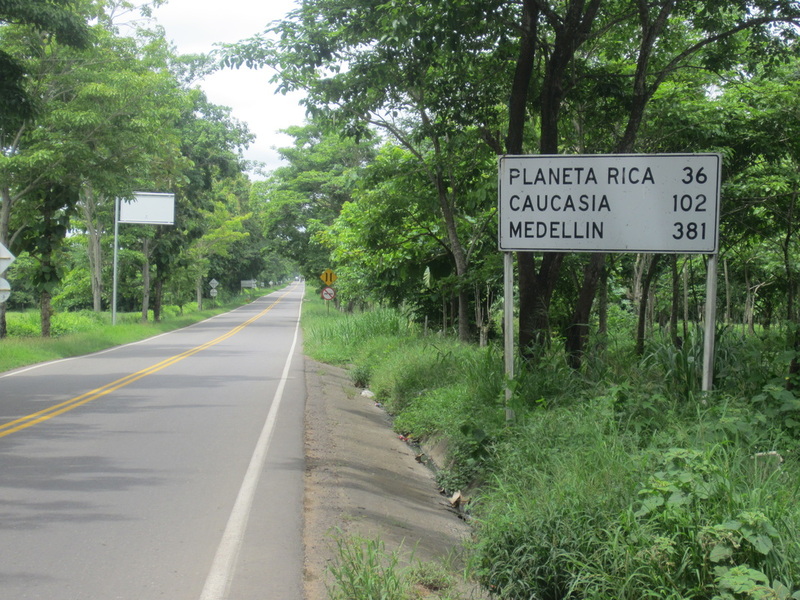 Good time was being made, arriving at Monteria at 1030, it was decided to keep going to Planeta Rica which is back on the main road to Medellin. 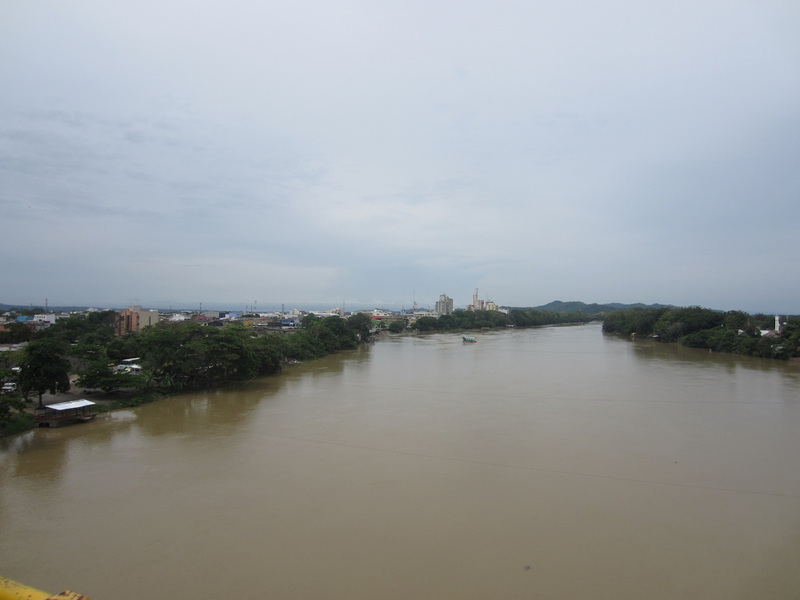 The journey to Monteria showed just how hard the Puerto run was. I had arrived here in good shape having done 60k in 3hrs, it took 9hrs to do 40k on that dirt track. Where ever possible eating is done at roadside stalls, here the people are the friendliest and the food is always more or less cooked in front of you. These people and their humour often provide inspiration for further kilometers travelled with ease. Some people were fixing a tyre at a small repair shop and cafe, north of Monteria. Stopping to talk, they offered me coffee, my first of the day. We talked for some time, it was such a good experience, lots of laughing and enjoying the kids. 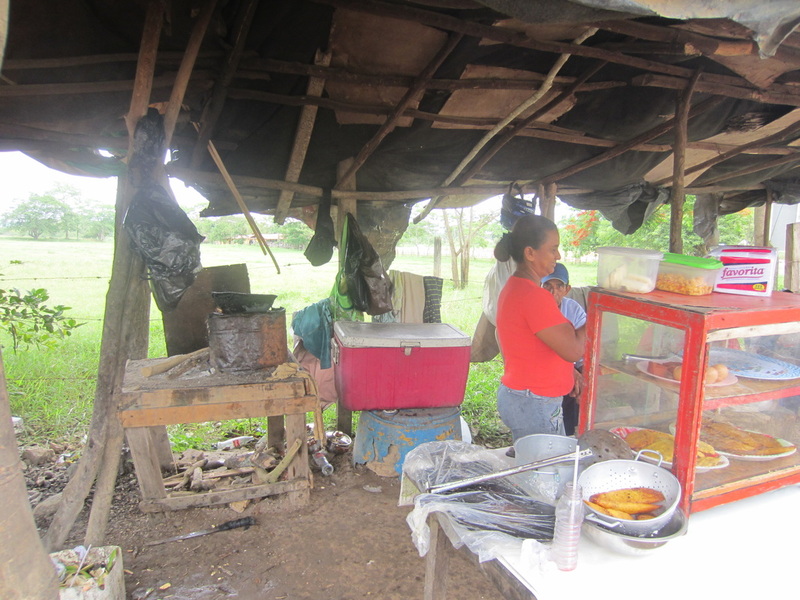 They would not take money for the coffee, I motioned to giving the kids 1000 pesos when they put their hands out I quickly pulled away, saying noooo. the parents laughed. These kind of people and the man that helped push my bike up the hill are offering their hospitality or help out of their goodness. The offering of money can be an insult to their goodwill. It is easy to distinguish between people helping for money and those helping because they are actually wanting to help. Arriving at Planeta Rica a hotel was spotted on the highway. The hotel Don Matias Caribe is highly recommended, very clean and comfortable, $15.50/night. 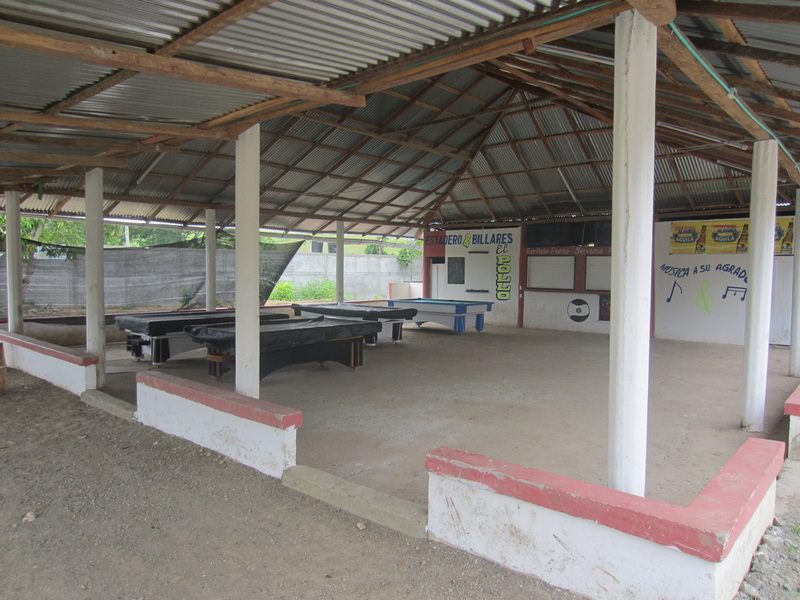 These pool bars are a big part of socialising for young men here.